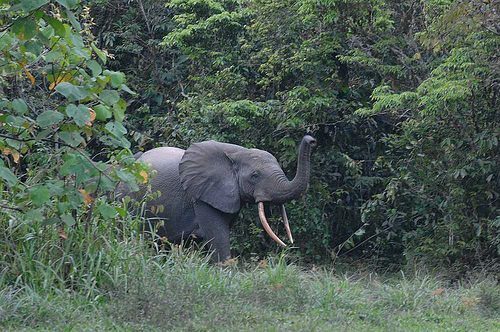 The African forest elephant (Loxodonta cyclotis) truly lives up to its name as it is only found in the forests of Congo Basin. African forest elephant and African bush elephants are two separate species. It is thought to be the third largest land mammal in the world. They are likely to be smaller in size as compared to those living in savannahs (bush elephants). Besides, African forest elephants have got rounded ears. 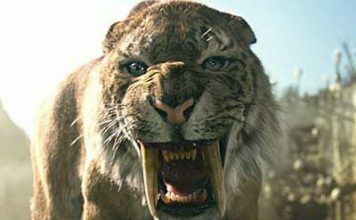 Its tusks are little yellowish to brown in color. Male elephants have long tusks and sometimes these are so long that they could touch the ground. Male elephants stand 2.5 m (8 ft) at the shoulder and weigh up to 2.7 tones (5,950 lb). Elephants do not grow once they reach the age of 10 – 12 years. They keep their body completely submerged in water while exposing the trunk out of it. Elephants mainly breathe by holding trunk out of water. The forest elephant’s feet are sensitive so much that they may sense any vibration on the ground. They can also recognize another elephant’s call at a distance of 10 miles away. Read More: Where Do African Elephants Live? African forest elephants are thought to occupy much of the western and central Africa. Their range extends to the southern Ghana, northern Congo, Cote D’Ivoire, southeastern Gabon, and finally the southwestern Central Africa. 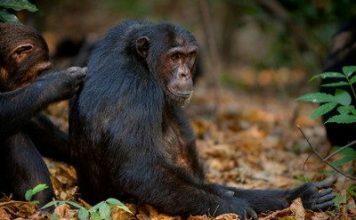 They are the animals of dense tropical forests and make homes in a wide variety of woody habitats including semi-evergreen, swamps, semi-deciduous tropical forests, and low-land tropical forests. When the land gets dry elephants shift toward the lowland tropical rainforests so that they could have a good reach of water. 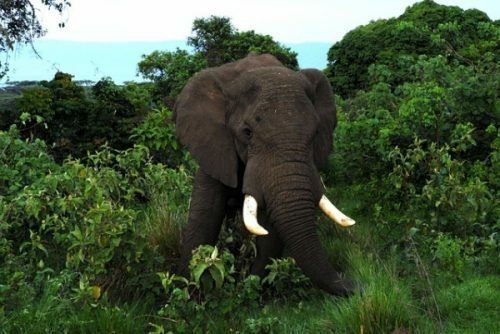 African forest elephant’s habitats can be found at an altitude of about 100 – 400 meters. Unlike most other elephants, the African forest elephant move in small groups. Each group consists of 3 – 5 individuals but the numbers rarely go beyond 8. In each group, there are one or more females which re followed by number of offspring. Males leave the group when they come of age. African forest elephants are often seen interacting with individuals of other groups. African bush elephants however do not. Outside the mating season they live a solitary life. The fastest speed of the African forest elephant is about 39 km/h (24 mph). Forest elephants mostly travel at night. African forest elephants are herbivores. They mainly rely on leaves, bark, seeds, grains, nuts, and fruits. It also eats mineral licks. Fruits make up the essential part of the elephant’s diet. Forest elephants are also referred to as ‘forest gardeners’ because they disperse seeds of few tree species including Omphalocarpum In fruits, elephants seem to prefer Swartzia fistuloides, and Klainedoxa gabonensis. They are thought to disperse more seeds than any other mammal in Africa. Females attain the maturity at 8 – 12 years age. However the maturity mainly depends on the availability of food and the quality of habitat. Males reach maturity the next year when the females become reproductive. The female gives birth to one offspring but twins are also born. A female remains pregnant for nearly 2 years. The breeding interval is 4 – 9 years. Young elephant become independent after 13 months. African forest elephants live up to 65 – 70 years in the wild. The average lifespan of a captive elephant is around 33 years. Humans are the only possible predators of African forest elephants. 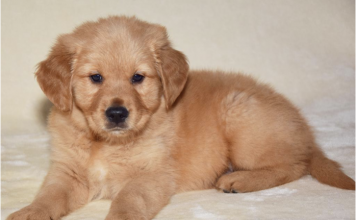 How much are Golden Retriever puppies?